Featuring: I Got Plenty o' Nuttin' / It Ain't Necessarily So / Summertime / Crab Man / Bess, You Is My Woman Now. Composed by George Gershwin (1898-1937). Arranged by James Barnes. 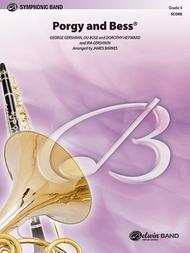 Concert Band; Masterworks; Performance Music Ensemble; Single Titles; Tony. Pop Symphonic Band. 20th Century; Broadway; Masterwork Arrangement; Standard. Score. 40 pages. Duration 8:30. Belwin Music #00-CB9802C. Published by Belwin Music (AP.CB9802C). The music from the timeless masterwork Porgy and Besshas fascinated generation after generation. Oddly enough, at its premiere the critics presented mixed reaction: some calling it the pioneering work of a new folk-opera genre, and others condemning it as merely a succession of hit songs. Fortunately, time has secured its place in history. James Barnes has skillfully crafted a wonderful scoring of "I Got Plenty O' Nuttin'," "It Ain't Necessarily So," "Summertime," "Crab Man," and "Bess, You Is My Woman Now." This is Gershwin at his best! (8:30).